Wild horses still run free in parts of the American Southwest, among the dunes of North Carolina's Outer Banks, and Virginia's Chincoteague Islands, symbols to us of spirited resilience, of independence, of strength and freedom, as well as loyalty and friendship. Available 18x30 with a double-cut mat in chestnut/gold, framed in oak, or 12x20 matted in chestnut with gold trim, and framed in oak, a limited edition reproduction from a pyrogravure colorée on fir, signed and numbered by the artist. 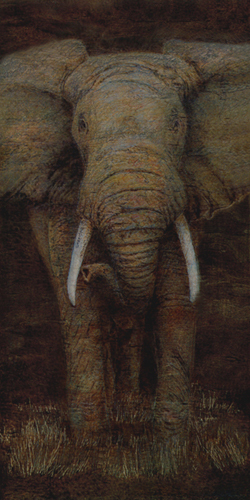 Noble protector of the herd, this bull elephant faces off against any challenger to the peace and safety of his family. 12x20 matted in your choice of gold-trimmed dark olive, chestnut, or dark ash, framed in oak and under glass, a limited edition reproduction from a woodburning on birch, signed and numbered by the artist. 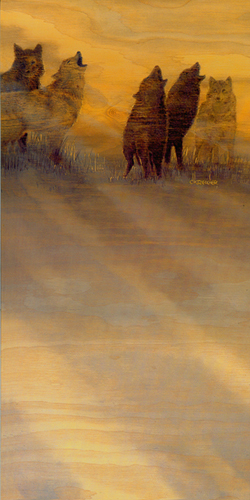 A lion emerges from the dry grass drawn by a scent in the air..
12x20 matted in your choice of gold-trimmed dark olive, chestnut, or dark ash, framed in oak and under glass, a limited edition reproduction from a pyrogravure colorée on birch, signed and numbered by the artist. Wolves on a snowy ridge at sundown. 12x20 gold-trimmed dark olive or ash mat framed in oak, a first generation mixed media work on paper from an intermediate pyrogravure colorée on fir. 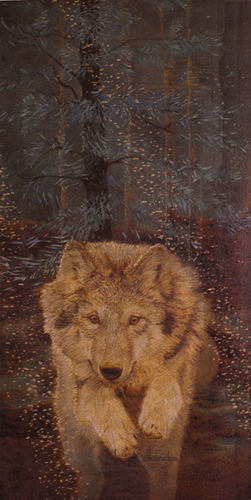 A young wolf on the hunt among the snowflakes and blue spruce. 12x20 gold-trimmed chestnut and tapestry mat, framed in oak and under glass, a limited edition reproduction from a pyrogravure colorée on poplar, personally signed and numbered by the artist.